Special #1 contains ten (10) posters. Five (5) posters will be the famous Las Vegas Aerial Posters and five (5) more posters of the eqaully famous Full Moon Over Las Vegas poster. The ultimate addition to any Las Vegas enthusiast are these posters. Enjoy Las Vegas from an aerial view and get the perspective of this 24-hour city. Aerial Posters measures 36 inches wide by 24 inches tall. Printed on quality paper, suitable for framing. Full Moon Over Las Vegas poster measures 15 inches tall by 26 inches wide. They printed a limited quantity of only 5,000 posters! Total of ten posters. Orders are processed within 48-hours. Retail price for the ten posters is $249.90. Our daily individual price for all 10 posters would be $12.95 each, total of $129.50. 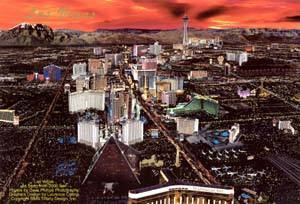 This special offers 5 Las Vegas Aerial Posters and 5 Full Moon Posters for only $89.95 Delivered free anywhere in the US. Ten posters makes up one unit when ordering.